We’ve briefly discussed heartworms before in this space, but it’s time to get a little more in depth about the issue. 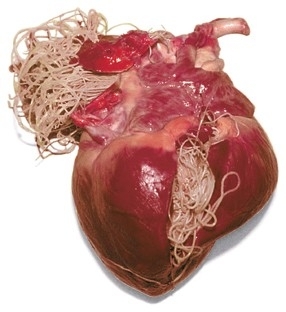 They are a parasitic worms that live in the heart, bloodstream and the blood vessels that feed the lungs. It is a condition that is as serious as it sounds. Shown here is a photo of a heart that has been infested by the parasites. As you can imagine, it is an often fatal condition to be infested. Too often we find that pet owners may take the “It’ll never happen to my family” approach and avoid regular heartworm prevention but this comes with serious risk, particularly in Ontario. In a 2010 Canada-wide study of heartworms in dogs that was published by the Ontario Veterinary College’s department of Pathobiology, results show us that incidents of heartworm have been on the rise to the tune of 60% from 2002-2010 and that 75% of all positive tests for the parasite in Canada happen in Ontario. Keep in mind, however, that these are only the number of reported cases, and there is currently no system in place to track every case of the disease. Those are startling numbers that illustrate the importance of prevention, particularly when shown that 80% of those positive tests were of pets that had not been on a preventive medication regime. In those cases when the pet had been on a medication, pet owners had forgotten to follow the prescribed intervals for dosage. How can you avoid your pet contracting heartworms? Book a trip to your vet to run a heartworm screening. Testing is the only way to detect the affliction at an early stage and preventive medications cannot be prescribed without a test being run first. This is most often done in the spring and your veterinarian will provide you and your pet with the tools you need to stay heartworm-free. This regime involves either a pill or a topical solution to be placed between the shoulder blades monthly during the mosquito season. A visit to your veterinarian is best timed before the mosquito larvae have the opportunity to hatch. Heartworm prevention is a very serious business but it’s not difficult. Make sure to visit your veterinarian this spring to arm yourself against this scourge.